Underground mining in China is reaching great depths. While in 2004, the mines at 1000 m depth were only 8, in 2015, these were more than 60. Thus, deep mining kept increasing and coal resources at depths greater than 1000 m account at present for 53% of the total available resources. Coal mining extends to depth at a rate of 10–25 m per year. There are about 47 coal mines in China at depth of 1000 m or deeper, with an average mining depth of 1086 m. This is, for example, the case of: Zhangxiaolou Coal Mine (1100 m) in Xuzhou; Zhaogezhuang Coal Mine (1159 m) in Tangshan; and Mentougou Coal Mine (1008 m) in Beijing. The deepest mine is the Suncun Coal Mine (1501 m), in Xintai City, Shandong Province. Metal and non-ferrous metal mines in China will enter depths ranging between 1000 and 2000 m. At present, there are about 32 deep metal mines, such as: Huize Lead Mine in Yunnan Province (1300 m); Shouwangfen Copper Mine (1300 m) in Hebei Province; and Dongguashan Copper Mine (1300 m) in Tongling, Anhui Province. The deepest mine is the Hongtoushan Copper Mine (1600 m) in Fushun, Liaoning Province. In addition, large-scale metal mines are under planning with a mining depth greater than 1000 m.
Other major mining countries have also mines at great depth. At present, there are more than 100 mines over 1000 m depth in South Africa, Canada, Germany, Poland, Russia, and other countries. In 1990, deep coal mines were active in Germany, Great Britain, Poland, Russia, Japan, and Belgium at 1000 m depth, in cases even approaching 2000 m depth. More than 80 metal mines with a depth greater than 1000 m have been mined in other countries. Most of the gold mines in South Africa are deeper than 2000 m, such as the Mponeng Gold Mine, which extends down to 4350 m. The gold mines in Canada have entered a level greater than 2000 m and approached 3000 m, as for the Kidd Copper–Zinc Mine in Timmins, which is 2800 m deep. The gold mines in India will enter depths of 2000–3500 m, as for a gold mine in the Kolar area at 3260 m depth. 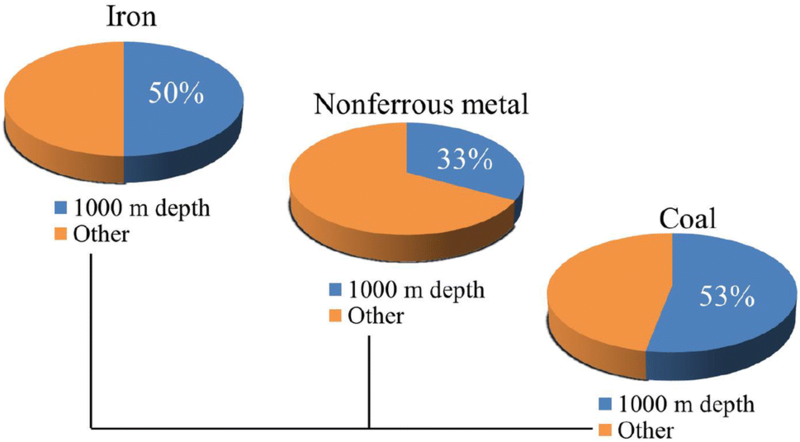 Russian metal mines will also enter depth levels between 2000 and 2500 m.
As shown in Fig. 1, taking China as an example, in the next 10–15 years, 50% of iron ore resources, 33% of non-ferrous metal resources, and 53% of coal resources will be mined below 1000 m depth. The following major challenges characterize mining at great depth: high in situ state of stress, high earth temperature, high pore/joint water pressure, and significant time-dependent effects. High stress is a decisive factor resulting in severe damages and accidents in deep mines. In mining below 1000 m, in situ stress often exceeds the rock mass compressive strength. For example, the maximum in situ principal stress at depth between 1000 and 5000 m can be 50–250 MPa, respectively, according to the results of in situ stress measurements. High earth temperature and high pore/joint water pressure increase the possibility of damage or violent disturbance. The geothermal gradient is 30–50 °C/km and the rock temperature can be greater than 40 °C at about 1000 m depth. High temperature will not only cause technical problems and impact the working conditions, but also influence the rock properties. At 1000 m depth, the hydraulic pressure is 10 MPa, which can result in hydraulic fracturing or water inrush accidents. 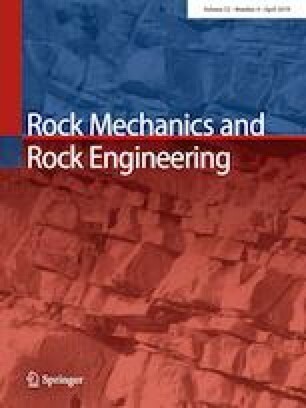 There is indeed a growing demand in advanced rock mechanics and rock engineering theory and practice in deep coal and metal mining. Recent trends and challenges are discussed in this Special Issue. The papers consider support systems, field monitoring, analysis of rock bursts, laboratory and in situ observations, in situ stress measurement, coal permeability, and evolution mechanism of coal and gas outbursts.